Even though I always try to cook healthier food, especially because of my kids, sometimes we allow ourselves a guilty pleasure or two. One of those pleasures is definitely deep fried food. There was a time when we consumed such meals in restaurants, but then I decided that I would rather prepare those dishes myself and make them as healthy and tasty as possible. Some of the deep fried foods my boys are just crazy about are all types of chicken, onion rings, oysters, shrimps and crispy french fries. Of course, it wouldn’t be possible to prepare those recipes if I didn’t have the best home deep fryer on the market. But the journey to this appliance wasn’t easy. Here are all the features I considered, and five products that can (almost) live up to my expectations. Most of the home deep fryers are made with different inside bucket or space for the food. Some offer enough capacity for large families up to more than 6-7 people, while the other is specified for smaller families or even couples. Oil capacity is not the same thing as the food capacity. Logically, both features are usually closely connected to the size of the whole appliance, but they are rarely the same. For me, it was very important to find out is the home deep fryer made with oil reuse in mind or without oil re-use cycles. If the oil can be saved and again used in the some of the next cooking processes, that can be a true life saver. The foods you are going to fry in your deep fryer are very different, and it is quite impossible for the chicken to be fried at the same temperature as the onion rings. Some home deep fryers are equipped with digital monitoring and automatic regulation of the temperature, while others contain adjustable thermostat that allows manual control. It is up to you to decide which feature suits you the best. Don't you just hate when all the work in the kitchen is almost done, and then you remember you haven't cleaned the cookware? For me, it can be a true nightmare especially if the pots, pans, and appliances are not easy to clean. It is very important to acquire a deep fryer that is simple to clean and that can be washed thoroughly so that you avoid any infection caused by collecting toxic micro-organisms because a dirty deep fryer can be an excellent habitat for bacteria. Some appliances have dishwasher safe parts, but on the other hand, some food baskets or bowls are not allowed to be washed with water or in dishwasher-machine. Different sizes of whole deep fryer could be marked as a beneficial feature if we focus on a different necessity. Also is important that there isn't too much space in everyone's house so that kind of people search for a smaller appliance while others with more kitchen comfort are probably looking for a larger product. Most of the home deep fryers work with the help of the electric energy as the main energy resource. However, there are many deep fryers that require gas as a power source. When it comes to electric energy, it is important to know how many watts some appliance has. More watts mean that food will probably be prepared considerably faster than in a less powerful deep fryer. For me, safety is always a priority when purchasing home appliances, especially because I love introducing my sons to the ways of the kitchen, so they could be more independent when the time comes for traveling to college or living alone. "Stay cool handles" are definitely a great addition for someone who doesn’t take safety for granted, because they are made of the materials that don’t absorb heat. Usually, these safe handles are found on the food basket, so when you want to take it out of the deep fryer and serve food, you will not avoid getting burned at high temperatures. The timer is also a useful feature, especially if you do not have spare time for standing beside the fryer throughout the entire process and you prefer multitasking. A timer will inform you when the cooking frying is almost finished or done, so you'll be able to prepare salad during that time or even clean the living room. A warranty tells you just how much confidence the manufacturer has in its product. Of course, the longer period it covers – the better. However, the period is not the only thing you should check when going through the warranty; it is imperative to see if it contains detailed information for different situations in case of the failures. Now that you know what you should pay attention to when buying a deep fryer, it is the time to check out five top rated units on the market and see how they live up to these high expectations. This unit is an excellent choice for large families with almost 2.65 pounds food capacity. It includes two available positions of the food basket which are ideal for preparing drained and cooked meals. The oil capacity is 3.5-liter tank which enables preparing large quantities of food in the generous amount of oil. The feature I loved the most is the oil filtration system that allows safe oil reuse, and not just once, but several times, without fear of consequences for your health. The filtration system automatically filters oil and prepares it for the next use. Moreover, the oil tray is removable as are the numerous parts of the appliance such as the bowl. Still, even though the oil capacity is satisfactory, the bowl is rather shallow. The 1700 watts of power put this appliance in top range products. The unit is equipped with temperature regulation which is controlled by the precise adjustable thermostat and power button. The biggest problem I had with this unit is that the heating element often reaches high heat because whole deep fryer is made of steel. However, this issue is partially addressed with the stay-cool handles. Finally, cleaning this case is nothing than one more move thanks to the specially designed system for easy clean-up. Additionally, all components are washable, so you can also use a dishwasher for maintenance or wash them by hand. Remember earlier when I said that by buying my deep fryer I could make fried food if just a bit healthier? Well, this unit is precisely what I was talking about – it allows perfect frying in less oil. The proportion between food servings and oil cups is 1:1. This means that you will be able to use just four cups of oil to prepare four food servings. 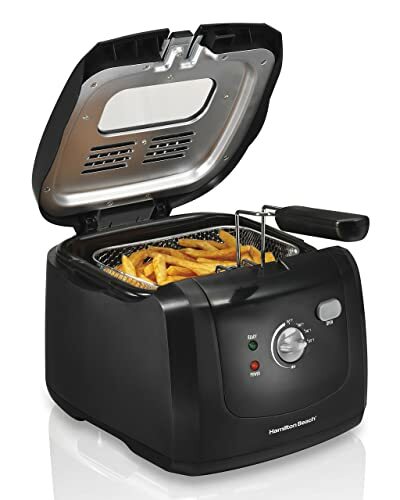 Logically, this home deep fryer is an ideal option for a family of few members. 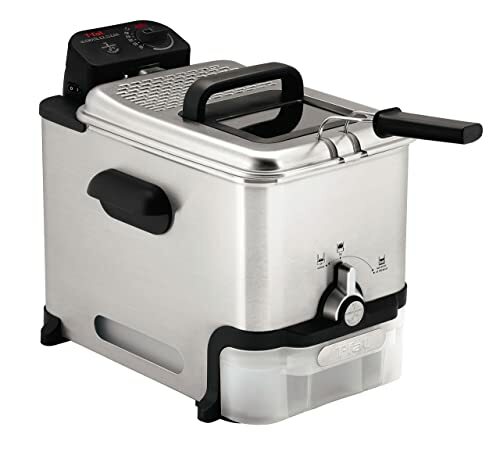 The appliance has been produced according to North American Electrical Standards, so I strongly believe that the power of 1200-watt is more than enough for a smaller sized deep fryer. It is made from a mix of two materials - metal and plastic. The metal used during the production is aluminum. An obvious problem about this deep fryer is that it doesn’t have any button for temperature regulation or similar function. The main controller is plug-in-the-cable – that is the only power regulator. The source of electrical energy automatically reduces the temperature. 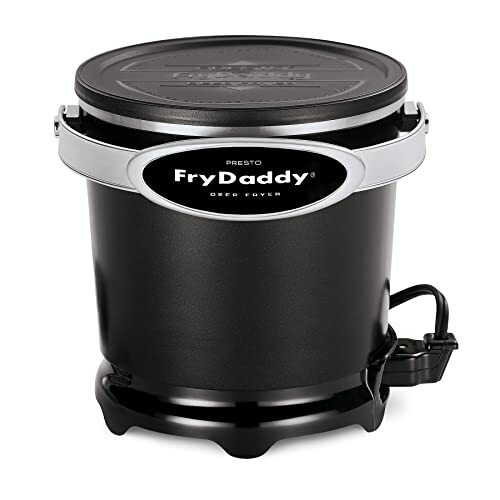 This deep fryer is very difficult to clean, and there are no dishwasher friendly parts. Another problem I have with Presto 05420 is that the lid cannot be used while frying because it is made of plastic. As a result, the oil goes everywhere while frying. Also, the Teflon coating doesn’t seem very durable. Firstly, Secura deep fryer has enough food capacity for a larger meal preparation, so it is great using it when you have guests coming over for dinner. The package includes three metal baskets with a plastic handle that is safe for the user without risk of burn injuries. The baskets are specially designed for different types of food, with two side-by-side baskets for smaller food batches and one pretty much bigger called jumbo basket for a good reason, because it is almost doubled in comparison to the two smaller. The next important feature is that your food can be ready immediately because of the product's admirable power. The 1700-watt home deep fryer is undoubtedly great choice, and moreover, it has a timer which helps you to perform other tasks while cooking. Heat control is regulated via an adjustable temperature controller that works typically in the range of 250 - 375 degrees F. Huge oil container with the 4.2-liter removable tank is there to make even the most demanding customers happy. Finally, removable elements are extremely useful and make cleaning very easy. 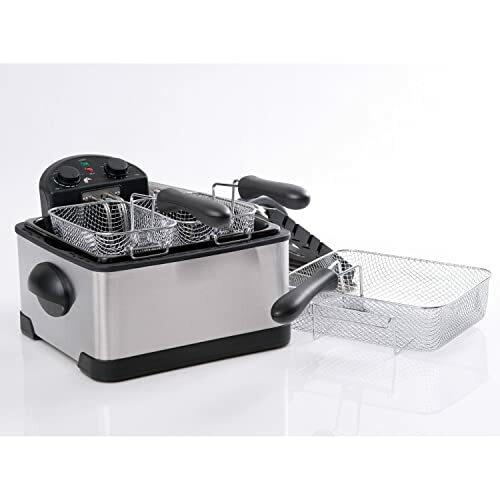 The whole body of the deep fryer is made of steel, while the additional components such as edges, timer, and temperature controller are plastic. The extra filter has the primary goal to regulate smells is also an excellent addition. The oil at the max line doesn’t cover the food in the basket that well, which sometimes requires you to turn the food to be cooked properly. Also, the power cord is short which doesn't allow you much choice when it comes to positioning the appliance in the kitchen. This is an unusually small, but a functional product for preparing homemade crispy food. The 2-liter oil capacity is more than enough for the appliance of this size that can be positioned everywhere in your kitchen. The already described size of the oil container is eight oil cups in other words. My favorite addition in this package is a special light closely connected to the oil temperature that provides you relevant information about the right moment to put food into it. Temperature regulation is on the front side of the deep fryer, and it allows manual controlling. When it comes to the food capacity, this tiny appliance is enough for preparing, for example, six cups of French fries at once. The special window allows a look inside the deep fryer. The Hamilton Beach home deep fryer also has cool-touch sides that unable to burn your hands in case of accidental touch – an addition that I’m especially happy about because of my boys. All parts of the product are removable which makes this unit very easy to clean. However, I’m not very happy about the speed of the food preparation, since the heat up takes at least five minutes (sometimes even ten) and then another five to ten minutes to deep fry. Also, the basket doesn't go very deep so that the food can be fried unevenly sometimes. Cuisinart CDF-100 is a compact product that offers a bucket with 3/4 pounds of food capacity is ideal for the smaller families or couples. The appliance is made of steel, but the manufacturer made sure for it to be safe for use, by securing the handles with plastic. The oil tank capacity can reach maximum 1.1-liter which is probably enough if we compare it with the food capacity. 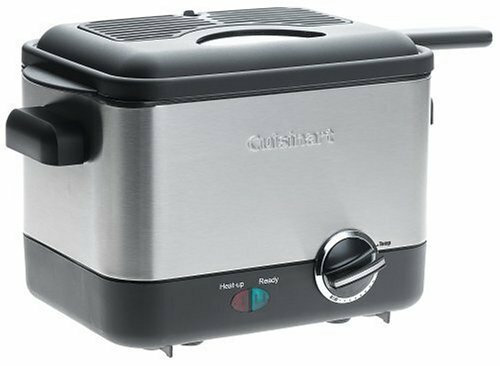 This Cuisinart home deep fryer is simple to store, easy to clean and pretty much easy for use. The red and green light give you information about the process inside, and the rotating button gives you full control over the temperature. Unlike the previous product, this unit heats up fast, which can be life-saving if you are having surprise guests or you just need to prepare food quickly. This is possible because of the particular heating element for the extremely fast and superior heating with the power of 1000-watts. Now that we have seen all of the features of the top five home deep fryers on the market, it is important to point out that all of them fare pretty well based on the criteria we set above. I liked working with most of them, even though some had pretty annoying flaws, such as Presto 05420 spilling oil all over my kitchen. All in all, there are two units I wouldn’t mind using again: Secura 1700-Watt and Cuisinart CDF-100, with the Secura’s deep fryer excelling in more areas, such as odor filter and food/oil capacity.